My Nissan Xterra has been an extremely reliable car. For a midsize SUV it gets good gas mileage while still being able to haul lots of material. I have moved from NC to TX and driven the trip to and from Texas about 6 or 7 times. The only major problem I have had with my xterra was that I had to replace the alternator in 2014. Now, the car is starting to show its age. The gas sensor has some problems and the check engine light stays on because of the gas sensor, but it runs so well and it's almost 14 years old. I love that it sits high, unlike some midsize SUVs I've ridden in or driven. The seats in the back also fold down, making it easy to carry lots of stuff. My favorite thing about the Xterra is its sporty look and the fact that it's a classic design. I don't think the XTERRA will ever go "out of style." 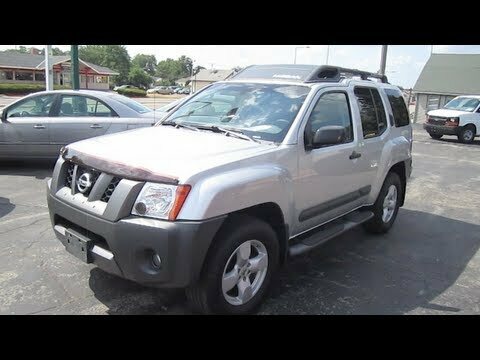 2005 Nissan Xterra SE decently priced and pretty efficient. In 8 years, only one major repair necessary. We have had our Nissan Xterra for 8 years no. We had no major issues until last year when the transmission went out and had to be replaced. It has always driven very well, and is a decently sturdy vehicle. There is also plenty of room in the back for my 2 children, with 3rd row seating as an add on option. We have only had to replace tires once since we bought the xterra. It has always passed inspection. Overall, minus having a very expensive repair bill for a new transmission last year, we have definitely got our money's worth. We have also traveled cross-country and up and down the East coast constantly since its purchase. Pretty decent highway mpg as well. Would buy again. My vehicle is beautiful and comfortable! My vehicle is beautiful. I love it; though I have had numerous problems with the engine. The original transmission blew up, and I have had a rebuilt engine put back into it twice now. I have also talked to other friends, family, or colleagues who own this vehicle; they all can attest to not only engine problems, but oil problems too. This car burns through oil quicker than any other car I have had. Other than these two issues; I love that its a manual, and the way it drives. I wish there were more xterras being made that were stick shift! ON CERTAIN SPORT UTILITY VEHICLES EQUIPPED WITH A NISSAN ACCESSORY TOW HITCH, INADEQUATE QUALITY OF SOME WELDED JOINTS IN THE HITCH ASSEMBLY MAY RESULT IN SEPARATION OF THE HITCH FROM THE VEHICLE WHEN BEING USED TO TOW. THIS COULD RESULT IN THE TRAILER SEPARATING FROM THE VEHICLE AND CAUSE A CRASH WITHOUT WARNING. DEALERS WILL REPLACE THE TOW HITCHES. THE RECALL IS EXPECTED TO BEGIN ON OCTOBER 24, 2005. OWNERS SHOULD CONTACT NISSAN AT 1-800-647-7261. CERTAIN VALLEY INDUSTRIES HITCH-CLASS III RECEIVER TRAILER HITCHES P/N 82850 MANUFACTURED BETWEEN MARCH AND SEPTEMBER 2005 SOLD FOR USE AS REPLACEMENT EQUIPMENT FOR 2005 NISSAN XTERRA PASSENGER VEHICLES. DUE TO INSUFFICIENT WELD STRENGTH, UNDER CERTAIN CIRCUMSTANCES, THE HITCHES MAY BREAK WHILE IN USE. THE TRAILER OR ITEM IN TOW MAY RELEASE PARTIALLY OR WHOLLY FROM THE MOTOR VEHICLE, POSSIBLY RESULTING IN A VEHICLE CRASH. VALLEY INDUSTRIES WILL NOTIFY ITS CUSTOMERS AND REPLACE THE TRAILER HITCHES FREE OF CHARGE. THE RECALL IS EXPECTED TO BEGIN ON OCTOBER 14, 2005. OWNERS SHOULD CONTACT VALLEY INDUSTRIES AT 209-368-8881.